Stayed Jul 10 We enjoyed very much our stay in the villa . Everything was ok, the villa is clean and easy to live. The pool also was very clean. The residence seems safe with gatekeepers. Location is very convenient, close to Fishermen village which is a nice small street with shops, bars and beachfront restaurants. We nevertheless recommend to rent a transport (car or motorcycle) to travel around. Stayed July 2012 We had a wonderful stay in this new, beautifully furnished and well equipped Thai villa. The lush gardens are a delight. The villa is very conveniently located. There is a quiet beach accross the road and many other beaches nearby. Stayed July 2012 Our first visit to Koh Samui was made perfect as we stayed at the villa, our private retreat after exploring the islands or as we did stay in the whole day, enjoying the garden and private pool. We are definitely coming back ! Stayed July 2012 A great week spent relaxing in Samui. The location was an excellent base from which to enjoy the sun, beaches and food of Samui. We thoroughly enjoyed the tranquil setting of the villa, luxurious decor and private pool strongly recommended ! Nestled amidst lush tropical gardens and coconut palms, and only steps from a golden sandy beach, this beautifully furnished two bedroom villa with a large private swimming pool, offers the perfect getaway. 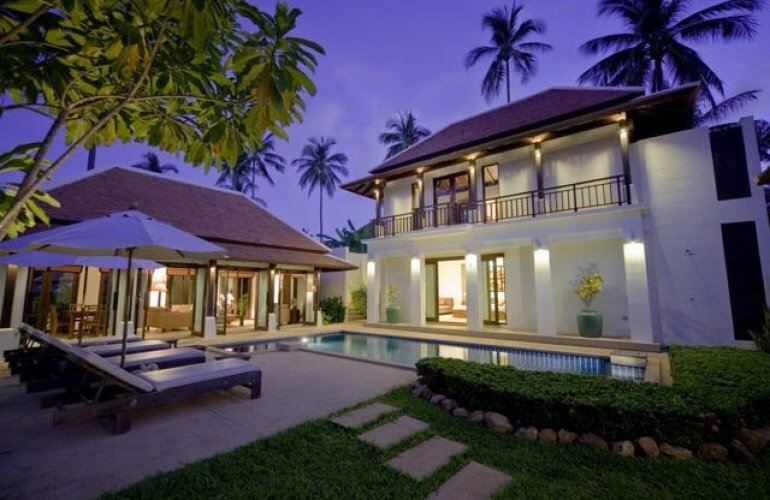 The villa reflects the very best in contemporary Asian design and offers luxurious living in three separate pavilions, making this property perfect for family groups or for sharing with friends. In the large pavilion there is an open-plan living area with a high vaulted ceiling containing a fully fitted European style kitchen, a formal dining table with seating for 6 and a large, comfy lounge with a multi-channel flat screen TV/DVD entertainment system. The second - a two story pavilion with two huge contemporary style bedrooms, each with en-suite bathrooms with shower enclosures, and an outside area featuring a large sunken terrazzo bathtub, perfect for wiling away the evening with a glass of champagne. One bedroom has a king size bed and in the other, two large single beds which can be joined making one extra large king size bed. Both bedrooms have nightstands and large fitted wardrobes offering ample storage and hanging space. The third pavilion, a large traditional Thai sala, provides a shaded refuge and alfresco dining venue for relaxed outdoor living. The pool terrace is furnished with cushioned sun loungers perfect for soaking up the rays and parasols for reading in the shade. The property is in a prime location in the prestigious northeastern part of the island. An easy 5 minute stroll will take you down to the long stretch of golden sandy beach and in the evening walk to local restaurants and bars or visit the charming "fisherman's village" of Bophut where you will discover many colourful shops, bars and a wide range of restaurants. The airport is a 10 minute drive and the villa is close to the vibrant nightlife of Chaweng, with its numerous shops, restaurants and evening entertainment just 20 minutes away and in 25 minutes you could be practicing your swing on the Santiburi Golf course.